Discussion in 'Amps and Cabs' started by Green Pro Am, Feb 19, 2012. I picked up one of these locally from a local dealer that was letting it go cheap. I think they had been sitting on it awhile. It was pretty dusty inside, but after a wipe down, it looks as good as new. I am digging it so far. I am running through my Boogie Recto 2 x 12 with V30s. So far so good. It sounds a bit darker than it did through the EVH cab at the store. One thing I found interesting is that my channel 3 lights up green on the chasis and red on the foot switch. I have played these before and channel three has always been red on both the switch and the chasis. Nots sure why that's the case. Cool. Maybe the lights blew at one time and the previous owner put them in wrong? Or he/she wanted them reversed for aesthetic reasons? 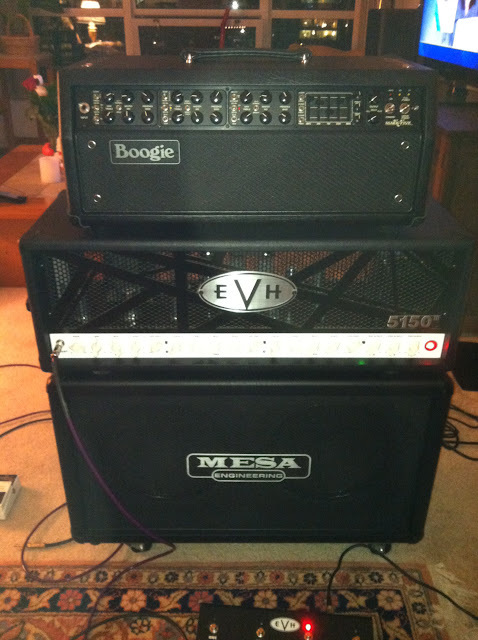 That's pretty much my setup, but I replaced the V30s in my Mesa 2x12 with Scumback M75s. Not sure about The green LED on Channel 3. Sounds like a factory oops. Check the sticker. I heard inspector 25534117 is color blind. What do you think of the Scumbacks? How do your shins like the sound of the amp? OHH!!! Congrats on the amp, OP! Definitely check out some 65 watt gb type speakers if you find yourself getting tired of your tone. I found that amp hard to dial in with the v30s. Looks like a rocking setup! Killer amp. I love mine. They are amazing and are the perfect match for this amp! I'm done buying speakers.